Rick Riordan was hanging out at Book Expo America. He gave a chat at the YA Author’s Tea, provided copies of The Serpent’s Shadow and later signed them. In addition, he just released the cover and synopsis of the newest installment to the Heroes of Olympus series, The House of Hades, due out in October… busy guy. This review, however, is about The Mark of Athena, the book just before October’s release of The House of Hades. 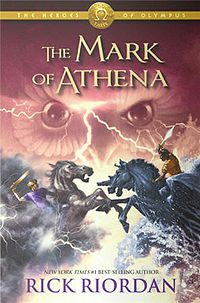 The Mark of Athena is a fast paced funny book told from several different viewpoints. In my mind this is one of the best Rick Riordan books I’ve read so far (and I’ve read almost all of themJ.) I am really complementing Mr. Riordan’s dialog when I say that it was almost as if a teenager wrote it!!!! Another thing that I love about this book is all of the mythology that he puts in! This third book in the Heroes of Olympus series is a modern take on classic myths. It is chock full of mysterious prophecies, sword fights, a little dash of romance, and a lot of snarky comments. Right from the beginning it hooks you in (even if you haven’t read the other books) by reuniting Annabeth and Percy at the Roman demigod camp, where they, Greek demigods, have no place. It also gives a quick recap on what has happened in the previous two books. Just a little nit-pickiness thing… I am not fond of how Mr. Riordan converted characters, that are historically GOOD, hero type guys into BAD GUYS! What the HECK?!? Also… and I ABSOLUTELY understand the author’s prerogative to end books with cliffhangers… but REALLY?!? THIS ONE?!? KILLER! Over all, though, this was a funny, laugh out loud book that is definitely on the “Keeper List”. I could read this book over and over again and have, in fact (I have to do SOMETHING while waiting for the 4th book!). If you love action and snarky, funny humor, and might even want to learn a little something about mythology in the process, you will definitely love this book.